At Storybook Theatre on Sunday, August 13th, at 4:00pm-6:00pm. Donations for Storybook Theatre's expenses will be accepted at the door. The event is sponsored by Apollo Kauai www.apollokauai.org. The Cuba documentary, was inspired when Faith Morgan and Pat Murphy took a trip to Cuba through Global Exchange in August, 2003. That year Pat had begun studying and speaking about worldwide peak oil production. In May Pat and Faith attended the second meeting of The Association for the Study of Peak Oil and Gas, a European group of oil geologists and scientists, which predicted that mankind was perilously close to having used up half of the world's oil resources. When they learned that Cuba underwent the loss of over half of its oil imports and survived, after the fall of the Soviet Union in 1990, the couple wanted to see for themselves how Cuba had done this. They found what Cubans call "The Special Period" astounding and Cuban's responses very moving. Faith found herself wanting to document on film Cuba's successes so that what they had done wouldn't be lost. Both of them wanted to learn more about Cuba's transition from large farms or plantations and reliance on fossil-fuel-based pesticides and fertilizers, to small organic farms and urban gardens. Cuba was undergoing a transition from a highly industrial society to a sustainable one. Cuba became, for them, a living example of how a country can successfully traverse what we all will have to deal with sooner or later, the reduction and loss of finite fossil fuel resources. In the fall of 2003 Pat and Faith had the opportunity to return to Cuba to study its agriculture. It was a wonderful trip. They saw much of the island, met many farmers and urban gardeners, scientists and engineers – traveling more than 1700 miles, from one end of Cuba to the other. It was all they had hoped for and more. The goals of this film are to give hope to the developed world as it wakes up to the consequences of being hooked on oil, and to lift American's prejudice of Cuba by showing the Cuban people as they are. The filmmakers do this by having the people tell their story on film. It's a story of their dedication to independence and triumph over adversity, and a story of cooperation and hope. Several Cubans expressed the belief that living on an island, with its natural boundaries, breeds awareness that there are limits to natural resources. "Try to image an airplane suddenly losing its engines. It was really a crash"... A crash that put Cuba into a state of shock. There were frequent blackouts in its oil-fed electric power grid, up to 16 hours per day. The average daily caloric intake in Cuba dropped by a third... So Cubans started to grow local organic produce out of necessity, developed bio-pesticides and bio-fertilizers as petrochemical substitutes, and incorporated more fruits and vegetables into their diets. Since they couldn't fuel their aging cars, they walked, biked, rode buses, and carpooled. At the Organipónico de Alamar, a neighborhood agriculture project, a workers' collective runs a large urban farm, a produce market and a restaurant. Hand tools and human labor replace oil-driven machinery. Worm cultivation and composting create productive soil. Drip irrigation conserves water, and the diverse, multi-hued produce provides the community with a rainbow of healthy foods. In other Havana neighborhoods, lacking enough land for such large projects, residents have installed raised garden beds on parking lots and planted vegetable gardens on their patios and rooftops. Since the early 1990s, an urban agriculture movement has swept through Cuba, putting this capital city of 2.2 million on a path toward sustainability. A small group of Australians assisted in this grass-roots effort, coming to this Caribbean island nation in 1993 to teach permaculture, a system based on sustainable agriculture which uses far less energy. This need to bring agriculture into the city began with the fall of the Soviet Union and the loss of more than 50 percent of Cuba's oil imports, much of its food and 85 percent of its trade economy. Transportation halted, people went hungry and the average Cuban lost 30 pounds. "In reality, when this all began, it was a necessity. People had to start cultivating vegetables wherever they could," a tour guide told a documentary crew filming in Cuba in 2004 to record how Cuba survived on far less oil than usual. The crew included the staff of The Community Solution, a non-profit organization in Yellow Springs, Ohio which teaches about peak oil – the time when oil production world-wide will reach an all-time high and head into an irreversible decline. Some oil analysts believe this may happen within this decade, making Cuba a role model to follow. "We wanted to see if we could capture what it is in the Cuban people and the Cuban culture that allowed them to go through this very difficult time," said Pat Murphy, The Community Solution's executive director. "Cuba has a lot to show the world in how to deal with energy adversity." Scarce petroleum supplies have not only transformed Cuba's agriculture. The nation has also moved toward small-scale renewable energy and developed an energy-saving mass transit system, while maintaining its government-provided health care system whose preventive, locally-based approach to medicine conserves scarce resources. 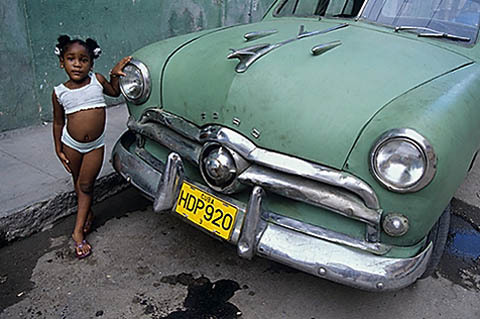 The era in Cuba following the Soviet collapse is known to Cubans as the Special Period. Cuba lost 80 percent of its export market and its imports fell by 80 percent. The Gross Domestic Product dropped by more than one third. "Try to image an airplane suddenly losing its engines. It was really a crash," Jorge Mario, a Cuban economist, told the documentary crew. A crash that put Cuba into a state of shock. There were frequent blackouts in its oil-fed electric power grid, up to 16 hours per day. The average daily caloric intake in Cuba dropped by a third. According to a report on Cuba from Oxfam, an international development and relief agency, "In the cities, buses stopped running, generators stopped producing electricity, factories became silent as graveyards. Obtaining enough food for the day became the primary activity for many, if not most, Cubans." In part due to the continuing US embargo, but also because of the loss of a foreign market, Cuba couldn't obtain enough imported food. Furthermore, without a substitute for fossil-fuel based large-scale farming, agricultural production dropped drastically. So Cubans started to grow local organic produce out of necessity, developed bio-pesticides and bio-fertilizers as petrochemical substitutes, and incorporated more fruits and vegetables into their diets. Since they couldn't fuel their aging cars, they walked, biked, rode buses, and carpooled. "There are infinite small solutions," said Roberto Sanchez from the Cuban-based Foundation for Nature and Humanity. "Crises or changes or problems can trigger many of these things which are basically adaptive. We are adapting." 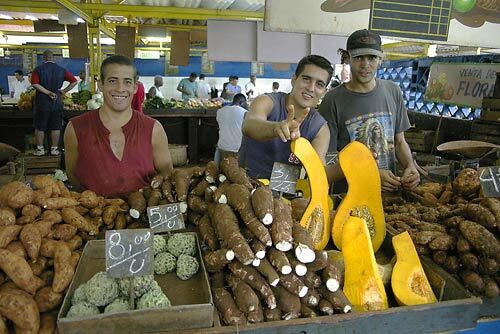 Farmers pose at private farmer's market with their produce in downtown Havana. Cubans are also replacing petroleum-fed machinery with oxen, and their urban agriculture reduces food transportation distances. Today an estimated 50 percent of Havana's vegetables come from inside the city, while in other Cuban towns and cities urban gardens produce from 80 percent to more than 100 percent of what they need. In turning to gardening, individuals and neighborhood organizations took the initiative by identifying idle land in the city, cleaning it up, and planting. 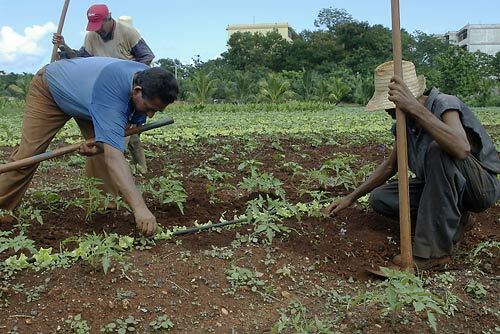 When the Australian permaculturists came to Cuba they set up the first permaculture demonstration project with a $26,000 grant from the Cuban government. Out of this grew the Foundation for Nature and Humanity's urban permaculture demonstration project and center in Havana. "With this demonstration, neighbors began to see the possibilities of what they can do on their rooftops and their patios," said Carmen López, director of the urban permaculture center, as she stood on the center's rooftop amongst grape vines, potted plants, and compost bins made from tires. Since then the movement has been spreading rapidly across Havana's barrios. So far López' urban permaculture center has trained more than 400 people in the neighborhood in permaculture and distributes a monthly publication, "El Permacultor." "Not only has the community learned about permaculture," according to López, "we have also learned about the community, helping people wherever there is need." One permaculture student, Nelson Aguila, an engineer-turned-farmer, raises food for the neighborhood on his integrated rooftop farm. On just a few hundred square feet he has rabbits and hens and many large pots of plants. Running free on the floor are gerbils, which eat the waste from the rabbits, and become an important protein source themselves. "Things are changing," Sanchez said. "It's a local economy. In other places people don't know their neighbors. They don't know their names. People don't say 'hello' to each other. Not here." Since going from petrochemical intensive agricultural production to organic farming and gardening, Cuba now uses 21 times less pesticide than before the Special Period. They have accomplished this with their large-scale production of bio-pesticides and bio-fertilizers, exporting some of it to other Latin American countries. Though the transition to organic production and animal traction was necessary, the Cubans are now seeing the advantages. "One of the good parts of the crisis was to go back to the oxen," said Miguel Coyula, a community development specialist, "Not only do they save fuel, they do not compact the soil the way the tractor does, and the legs of the oxen churn the earth." "The Cuban agricultural, conventional, 'Green Revolution' system never was able to feed the people," Sanchez said. "It had high yields, but was oriented to plantation agriculture. We exported citrus, tobacco, sugar cane and we imported the basic things. So the system, even in the good times, never fulfilled people's basic needs." Drawing on his permaculture knowledge, Sanchez said, "You have to follow the natural cycles, so you hire nature to work for you, not work against nature. To work against nature, you have to waste huge amounts of energy." Because most of Cuba's electricity had been generated from imported oil, the shortages affected nearly everyone on the island. Scheduled rolling blackouts several days per week lasted for many years. Without refrigerators, food would spoil. Without electric fans, the heat was almost unbearable in a country that regularly has temperatures in the 80s and 90s. The solutions to Cuba's energy problems were not easy. Without money, it couldn't invest in nuclear power and new conventional fossil fuel plants or even large-scale wind and solar energy systems. Instead, the country focused on reducing energy consumption and implementing small-scale renewable energy projects. Ecosol Solar and Cuba Solar are two renewable energy organizations leading the way. They help develop markets for renewable energy, sell and install systems, perform research, publish newsletters, and do energy efficiency studies for large users. Ecosol Solar has installed 1.2 megawatts of solar photovoltaic in both small household systems (200 watt capacity) and large systems (15-50 kilowatt capacity). In the United States 1.2 megawatts would provide electricity to about 1000 homes, but can supply power to significantly more houses in Cuba where appliances are few, conservation is the custom, and the homes are much smaller. About 60 percent of Ecosol Solar's installations go to social programs to power homes, schools, medicals facilities, and community centers in rural Cuba. It recently installed solar photovoltaic panels to electrify 2,364 primary schools throughout rural Cuba where it was not cost effective to take the grid. In addition, it is developing compact model solar water heaters that can be assembled in the field, water pumps powered by PV panels, and solar dryers. A visit to "Los Tumbos," a solar-powered community in the rural hills southwest of Havana demonstrates the positive impact that these strategies can have. Once without electricity, each household now has a small solar panel that powers a radio and a lamp. Larger systems provide electricity to the school, hospital, and community room, where residents gather to watch the evening news program called the "Round Table." Besides keeping the residents informed, the television room has the added benefit of bringing the community together. "The sun was enough to maintain life on earth for millions of years," said Bruno Beres, a director of Cuba Solar. "Only when we [humans] arrived and changed the way we use energy was the sun not enough. So the problem is with our society, not with the world of energy." 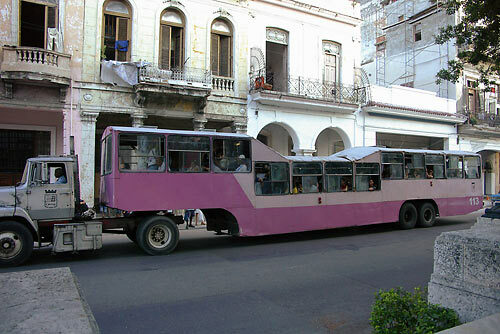 This unique Cuban transport vehicle, called a "camel", can carry 300 passengers through Havana. Cubans also faced the problem of providing transportation on a reduced energy diet. Solutions came from ingenious Cubans, who often quote the phrase, "Necessity is the mother of invention." With little money or fuel, Cuba now moves masses of people during rush hour in Havana. In an inventive approach, virtually every form of vehicle, large and small, was used to build this mass transit system. Commuters ride in hand-made wheelbarrows, buses, other motorized transport and animal-powered vehicles. One special Havana transit vehicle, nicknamed a "camel," is a very large metal semi-trailer, pulled by a standard semi-truck tractor, which holds 300 passengers. Bicycles and motorized two-passenger rickshaws are also prevalent in Havana, while horse drawn carts and large old panel trucks are used in the smaller towns. Government officials in yellow garb pull over nearly empty government vehicles and trucks on Havana's streets and fill them with people needing a ride. Chevys from the 1950s cruise along with four people in front and four more in back. A donkey cart with a taxi license nailed to the frame also travels Cuba's streets. Many trucks were converted to passenger transport by welding steps to the back so riders could get on and off with ease. Even though Cuba is a poor country, with a per capita Gross Domestic Product of only $3,000 per year (putting them in the bottom third of all nations), life expectancy is the same as in the U.S., and infant mortality is below that in the U.S. The literacy rate in Cuba is 97 percent, the same as in the U.S. Cuba's education system, as well as its medical system is free. When Cubans suffered through their version of a peak oil crisis, they maintained their free medical system, one of the major factors that helped them to survive. Cubans repeatedly emphasize how proud they are of their system. Before the Cuban Revolution in 1959, there was one doctor for every 2000 people. Now there is a doctor for every 167 people. Cuba also has an international medical school and trains doctors to work in other poor countries. Each year there are 20,000 Cuban doctors abroad doing this kind of work. With meat scarce and fresh local vegetables in abundance since 1995, Cubans now eat a healthy, low-fat, nearly vegetarian, diet. They also have a healthier outdoor lifestyle and walking and bicycling have become much more common. "Before, Cubans didn't eat that many vegetables. Rice and beans and pork meat was the basic diet," Sanchez from the Foundation for Nature and Humanity said. "At some point necessity taught them, and now they demand [vegetables]." Doctors and nurses live in the community where they work and usually above the clinic itself. In remote rural areas, three-story buildings are constructed with the doctor's office on the bottom floor and two apartments on the second and third floors, one for the doctor and one for the nurse. In the cities, the doctors and nurses always live in the neighborhoods they serve. They know the families of their patients and try to treat people in their homes. "Medicine is a vocation, not a job," exclaimed a Havana doctor, demonstrating the motivation for her work. In Cuba 60 percent of the doctors are women. Education is considered the most important social activity in Cuba. Before the revolution, there was one teacher for every 3,000 people. Today the ratio is one for every 42 people, with a teacher-student ratio of 1 to 16. Cuba has a higher percentage of professionals than most developing countries, and with 2 percent of the population of Latin America, Cuba has 11 percent of all the scientists. In an effort to halt migration from the countryside to the city during the Special Period, higher education was spread out into the provinces, expanding learning opportunities and strengthening rural communities. Before the Special Period there were only three institutions of higher learning in Cuba. Now there are 50 colleges and universities throughout the country, seven in Havana. Throughout its travels, the documentary crew saw and experienced the resourcefulness, determination, and optimism of the Cuban people, often hearing the phrase "Sí, se puede" or "Yes it can be done." People spoke of the value of "resistir" or "resistance," showing their determination to overcome obstacles. And they have lived under a U.S. economic blockade since the early 1960s, viewed as the ultimate test of the Cuban ability to resist. There is much to learn from Cuba's response to the loss of cheap and abundant oil. The staff of The Community Solution sees these lessons as especially important for people in developing countries, who make up 82 percent of the world's population and live more on life's edge. But developed countries are also vulnerable to shortages in energy. And with the coming onset of peak oil, all countries will have to adapt to the reality of a lower energy world. With this new reality, the Cuban government changed its 30-year motto from "Socialism or Death" to "A Better World is Possible." Government officials allowed private entrepreneurial farmers and neighborhood organizations to use public land to grow and sell their produce. They pushed decision-making down to the grassroots level and encouraged initiatives in their neighborhoods. They created more provinces. They encouraged migration back to the farms and rural areas and reorganized their provinces to be in-line with agricultural needs. From The Community Solution's viewpoint, Cuba did what it could to survive, despite its ideology of a centralized economy. In the face of peak oil and declining oil production, will America do what it takes to survive, in spite of its ideology of individualism and consumerism? Will Americans come together in community, as Cubans did, in the spirit of sacrifice and mutual support? "There is climate change, the price of oil, the crisis of energy …" Beres from Cuba Solar said, listing off the challenges humanity faces. "What we must know is that the world is changing and we must change the way we see the world." This article appeared in the special Peak Oil issue of Permaculture Activist, Spring 2006. The author, Megan Quinn, is the outreach director for The Community Solution, a program of Community Service Inc., a nonprofit organization in Yellow Springs, Ohio. Photos for this article are by John Morgan. e-mail her at megan@communitysolution.org, or call 937-767-2161.